We highly recomend taking Intro to Fusion 360 or having previous knowledge of Fusion 360 before enrolling in this class. 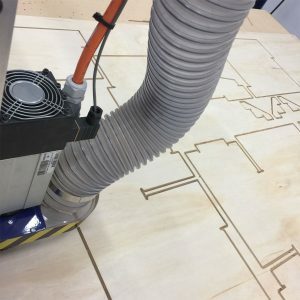 Introduction to Fusion 360 for ShopBot is a first look at the CAM (Computer Aided Machining) capabilities of Fusion 360 and how it can be used with our CNC mill the 5×8 ShopBot. Free to use for hobbyists, Fusion 360 is a powerful for digital production across a number of platforms including CNC milling, laser cutting and etching, and 3-D printing. This class will run over two consecutive days and cover the basics of 2D and 2.5D cnc milling strategies including, file preparation, feeds and speeds, work-holding and general safety and operation of the ShopBot machine. By the end of class students will have a solid understanding of the CAM capabilities of Fusion 360 and be capable of operating the Shopbot unsupervised.